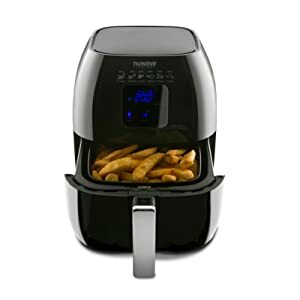 Air fryers’ success are measured with French fries or fried chicken, but with a lot range of different accessories, they can provide you a whole lot of different meals. If you’re looking for a complete set of air fryer accessories, then Cozyna can provide you 5 accessories in just a price of 1, which also fits most of the air fryers available starting from 3.7 qt up to 5.8 qt. They universally fitting accessories let you bake with the Bake Barrel, cook pizza with the Pizza Pan, roast with Skewer Rack, and double your cooking space with the Metal Holder. Plus, the heat-resistant Silicone Mat your countertop from burns. Hiware gives you 3 accessories for half the price of its competitors. The baking dish and the pizza pan can get you started with different cooking techniques with your Philips or GoWise air fryer models. The 12 skewers are more than enough to get you veggie or meat kabobs in no time. And with almost 7 inches in size, it could also fit your XL air fryer machines. With the Double Layer Rack, your Philips Airfryer can cook two flat food dishes at the same time as the double layer rack is divided horizontally, so it saves you half the time in cooking but expands the space in cooking, too. Plus it comes with 6 skewers if you’re into barbecuing. Grilling never been so perfect with the air fryer machine with this grill pan accessory. It’s not like other air fryer grill pan because of its uniquely ribbed non-stick surface. The Rapid Air Technology circulates evenly to cook food perfectly in the shortest time possible and with just a wipe to clean up. With Philips Non-Stick Baking Dish, you will love baking with your Philips Viva Collection Airfryer because you will have mess-free, healthy, quick, and easy baked dishes. Your baked goodies will just slide out of this pan and you’ll be enjoying it in no time! By far, this set of air fryer accessories is the best! As you can see, you got 5 in just a price of 1. And all 5 are designed to a specific cooking setting program, so you’ll going to have fun using your air fryer machine with these accessories for sure. If you have different air fryers, these kit will work for you. All these 5 accessories universally fit most of the air fryer machines, from Cozyna, Philips, GoWise, Power Air Fryer, Farberware air fryer, etc. If you’re tired of frying with your air fryer and wants to be creative with your machine, Cozyna’s 5 accessories will cover all your needs. The Baking Barrel and the Pizza Pan are non-stick so your food will just slide out of them. If you’re such a busy person, the Skewer Rack and Metal Holder will add more cooking space so you can cook two dishes at the same time. If you’re into fast and easy clean-ups then you don’t have to worry with these accessories as they are all dishwasher-safe. So once you’re done, just toss them on the dishwasher. You can use all these accessories with an XL air fryer but they are too small so you’ll have to cook in batches. If you’re just starting to use your air fryer machine and you’re not sure what accessories to buy, then I suggest Hiware Air Fryer Accessory Kit as your starting accessories. It gives you three basic accessories that you can play with your Philips or GoWise air fryers. Also, with below 7 inches height and width, it can fit into your XL air fryer machines. Cleaning the accessories are also easy with the non-stick coating on the pans and the metal finish with the skewers. You can easily wipe them with a damp cloth or have them washed on the dishwasher. It’s just a little disappointing that the skewers don’t have a rack to nestle them on inside the air fryer. It’s also very helpful if it does include a mat for holding the hot accessories. If you’re into quick fix foods but would like to have a variety of dishes, use the Airfryer Double Layer Rack with Skewers to your Philips Airfryer HD9220 and HD9230 so you can enjoy two healthy meals with half the time of cooking. Busy mommies and people on-the-go will best benefit from this accessory because you will not only enjoy two delicious meals but you will also have less time in cooking and prepping. If you’re into a Paleo diet, this accessory will help you continue your lean meat meals as the double layer rack is divided horizontally so it is best used with flat foods like burger patties, pork chops, steak, fish fillet. And to give you a variety, have your lean meat with non-starchy veggies on a skewer and enjoy Paleo kebab for a change. The only problem is the metal rack gets super hot and it does not have a heat-resistant handle, so when you want to remove it from the airfryer machine, you need to make sure they’re cool enough to touch/hold or you’re wearing an oven mitt to protect your hand from the hot surfaces. If you want to eat healthier grilled dishes without the worry of grease and burned edges, then this grill pan accessory from and for Philps Airfryer is what you only need. It can deliver you evenly seared and browned meals, as well. Because the cooking technique of air frying is circulating hot air, the holes on the grill pan lets the heat circulate evenly thus cooking your food evenly, too. If you need quick-fix yet delicious and healthy meals, this grill pan is your go-to accessory because the cooking surface heats up so quickly that it cuts 20% of your cooking time. Moms with many kids and lazy millennials will love this grill pan because it’s non-stick surface makes it very easy to clean; you just have to put it in the dishwasher or wipe it with a damp cloth. Feeding a big family is no problem because a whole fish fits perfectly in the grill pan. And if you get tired of grilling, this grill pan accessory works great with frying, searing, and even browning your favorite meat and vegetables dishes, as well. The grill pan is compatible with Philips Airfryer HD9220 and HD9230 but not with Philips XL Airfryer. Baking with your airfryer is also exciting because it halves the time of cooking as this baking dish accessory’s surface quickly heats up and all you need to do is take all the time you have indulging your baked goodies. This baking accessory is best for budding bakers because the 1.3 liter capacity will let you create dishes good for taste-tasting or for two people. You can create as many baked dishes as you like with minimum effort! Moms with super-active kids will benefit a lot from its rapid cooking and quick release food because of the non-stick coating. It also makes it dishwasher-safe for a fast and easy clean up. It does have a handle but since it’s made of metal, you have to use heat-resistant or protective gloves for you to remove it from the machine. 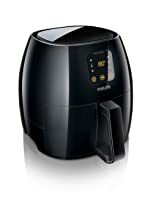 It is also compatible Philips Airfryer HD9220 and HD9230 but not with Philips XL Airfryer and other larger airfryers. All these accessories can ft your cooking style and most importantly, they can fit into a variety of air fryer machines. They are dishwasher-safe so your clean-up is a breeze and with their non-stick coating, you’ll love how food just slides off the pans. The accessories give you more cooking space and it lets you try more dishes to cook with the air fryer. So just enjoy and be creative with your accessories. Air fryers are all the rage in cooking. Have you seen one of the many advertisements and wondered, “How does an air fryer work?” Are you curious about the health of an air fryer? Worry no more! You have landed on the right page to answer all of your air frying questions. If the term “air fryer” sounds like a lot of hot air, your speculations are exactly right! 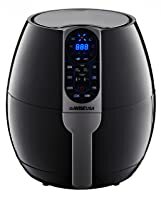 An air fryer is simply a revolutionized kitchen appliance for cooking food through the circulation of superheated air. It is a new invention from Philips that offers healthy, tasty foods with less oil. Do the fries taste deep-fried? Rapid Air Technology: A New Generation of Cooking Equipment. 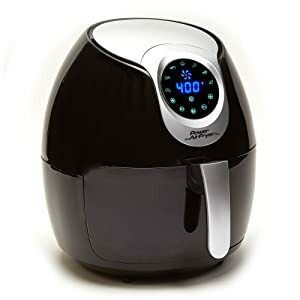 An air fryer’s cooking chamber radiates heat from a heating element close to the food, thus cooking it more efficiently and appropriately. The exhaust fan located above the cooking chamber helps to provide the required airflow from the underside. This allows the heated air to constantly pass through the food. Consequently, every part of the food receives the same heating temperature. 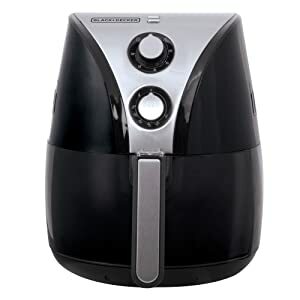 Using only a fan and grill helps the air fryer to blast hot air at a high speed, achieving the healthy qualities that you will undoubtedly notice when eating air fried food. It is a simple yet innovative method of cooking. Similar to a rice cooker, an air fryer has a wide removable tray. It serves up a hot, crisp meal within 12 minutes. Though it may seem “fried” because of the crispy quality, the food cooked in an air fryer is actually healthier and reduced in calories. Philips CEO Pieter Nota said, “At Philips, we develop advanced solutions that help contribute to people’s health and well-being.” Anything you can think of, from chicken to chips to fish can be made healthier in an air fryer because its cooking method requires very little fat. For instance, a batch of chips only calls for half a spoonful of oil and 12 minutes to serve perfectly crispy potatoes. Similarly, an air fryer will give you hamburgers, steaks, and French fries in just a few minutes. You’ll be amazed, but in just 25 minutes, you can bake an entire cake in an air fryer! The exhaust system controls the temperature that is increased by internal pressure and emits extra air as needed to cook the food. The extra air is thoroughly filtered before being released, thus being better to the environment. Air fryers are both user and environment-friendly – harmless and odorless! ->> Oil less fryer with 70% Less Oil. Do not be afraid of the superheated air that is used to cook food in an air fryer. Each comes with its own cooling system, including a fan mounted on a motor axis to control the internal temperature. This fan ensures that the environment inside the air fryer stays clean and healthy. The cooling system allows fresh air to pass through the filters and proceed to the bottom of the fryer. Allowing the passage of fresh air from top to bottom helps the air fryer to cool its internal parts. The air fryer’s benefits are endless. It helps users who are nervous when using a traditional chip pan and protects them from fire or burning. Its cooling systems and controlled temperature allow it to protect itself. Better tasting food, healthier meals, friendlier to the environment – we could go on and on. Try ad air fryer for yourself and discover even more benefits! Air fryers were first launched in Australia and Europe in 2010, followed by North America and Japan. Today, they are a staple of the modern kitchen. 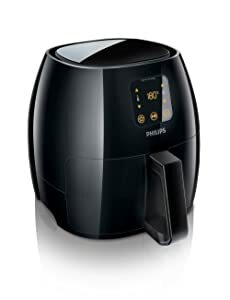 The Japanese use air fryers for making fried prawns, in the Netherlands and the UK, this gadget is used for cooking chips. Americans prepare chicken wings in their air fryers. Indians use them for making samosa. Can we cook different varieties of food in an air fryer? Answer- Yes, you can easily cook different varieties of food in an air fryer. One of the best things about cooking food in an air fryer is that it is healthy and free from oil. Items such as meat, potatoes, poultry and French fries can be easily cooked. Apart from these items you can also bake brownies and grill different vegetables. Answer- For the European market the input power range is 220 v and for USA market it is 110 v.
How much time an air fryer takes to cook frozen foods? Answer- One of the best things to do while cooking frozen food in an air fryer is to use the knob as per the food that you are cooking. It normally takes some more time to cook frozen foods as compared to other food items. How much food can be cooked at a time in an air fryer? Answer- It all depends on the capacity of the air fryer. Most of the air fryers come with 500g of capacity and you can also see a “max” mark on the basket of the air fryer which means that the air fryer can be filled up to this mark. Is there any specific type of oil required for air fryer? Answer- No, there is no special oil which is required for cooking in an air fryer. You can us any type of oil such as olive oil, peanut oil, sunflower oil and even butter spray. 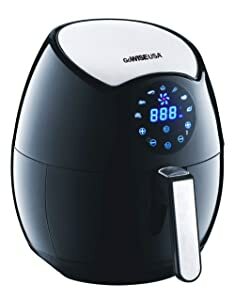 Can we add more ingredients while the food is getting cooked in an air fryer? Answer-Yes, you can add more ingredients while the food is getting cooked in an air fryer but make sure to add the ingredients immediately otherwise the heat loss may lead to more time consumption for cooking the food. Is it possible to use baking paper or aluminium foil in an air fryer? Answer- Yes, you can use a baking paper or aluminium foil but you need to make sure that appropriate space is given so that the steam can pass easily. How many items can be cooked at a go in an air fryer? Answer- You can easily cook two different items at a go in an air fryer but make sure to use the divider. This will help in proper cooking and less time will be consumed. Do we need to preheat the air fryer? Answer- No, there is no need to preheat the air fryer. However, pre-heating the air fryer for about 4 minutes can help in significant reduction of the cooking time. 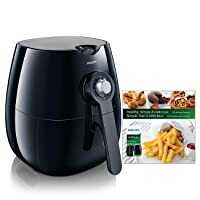 Does air fryer help in making food crispy and tasty? Answer- Yes, the food that you cook in an air fryer is as tasty and crispy as it is with frying. One of the main reasons why air fryer cooks tasty and crispy food is because it helps in keeping the outer layer of the food crisp and the inside gets soft.